PICTURES of the 2007 state visit of Libyan leader Muammar Gaddafi to France do not appear on the website of the French president. After a day of questioning from newspapers, the Elysée Palace has produced a range of explanations ranging from “human error” and “miscataloguing” to the fact that the visits of foreign leaders to France are given less prominence than the president's visits abroad. The Elysée Palace also told Le Poste that the reason pictures of the French president's visit to Libya could not be found was because the word Libye had been spelt wrong when they were uploaded and indexed. The photos are on the site here. 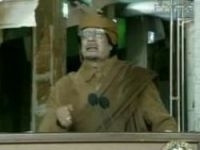 Gaddafi's visit cause outcry in France and, while President Sarkozy told a press conference that he had raised the issue of human rights with the Libyan leader, Gaddafi denied it. Journalist Paul Larrouturou claims a photos of the president looking too friendly with the former leader of Egypt Hosni Mubarak has also been removed http://twitpic.com/3z13v9.